Just like in her macrame, she has used the raw materials of life experiences and woven them into her new stronger self. Born in Madrid, Ikram Maymouni spent most of her childhood and teenage years in San Sebastián, a picturesque town on the Bay of Biscay in Basque Country. 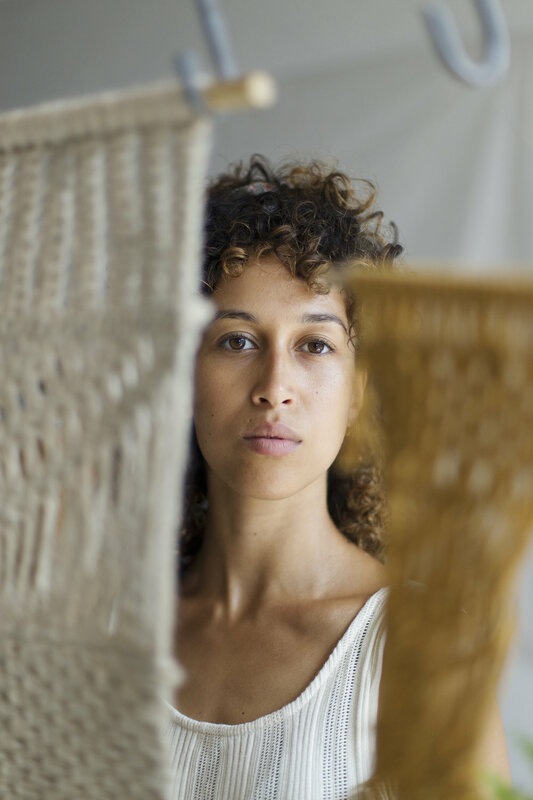 Currently based in Barcelona, Ikram explores her passion for macrame - an ornamental work made by knotting and weaving coarse thread into a pattern. In addition, she supports Mamita Botanical Skincare - a natural cosmetic brand owned by a friend who’s about to set her foot on the path of motherhood as well. Being at a similar stage in life encouraged mutual understanding in their work relationship, which results in maintaining a good work-life balance as these two women strive to support each other on day-to-day basis. Ikram’s job consists mainly in hosting workshops for people interested in natural skincare. You may have an impression that this is a dream job for somebody passionate about natural products, however, Ikram admits hosting workshops for several people, especially women, is a challenge. She grew up without father figure, which she believes determined her relationships with women. Her early friendships with girls were not always easy as she felt rather insecure around them. Today she’s aware of her strengths and weaknesses, although she admits it was a long journey. As a young girl Ikram would surround herself with male friends. Boys, she thought, were not as critical as girls. But as she was maturing both mentally and physically, Ikram started opening up for women and seeing them as allies and not enemies. This is a journey that so many of us experience: born women, making our way through the jungle of social constructs as adolescents, finally, separating what’s “I” and what’s society’s idea of me, and consequently, meeting people who lift us up instead of dragging us down. It was only two of them: Ikram and her mother and due to that fact young Ikram spent many of her summer vacations on camps, as her mother worked in order to provide for their little family. Thanks to summer breaks away from home, Ikram quickly learnt independence. She said her and her peers did lots of sports at the camps and used hours on mastering different kinds of crafts, among them knotting. They would make their own “friendship bracelets” and she loved it. 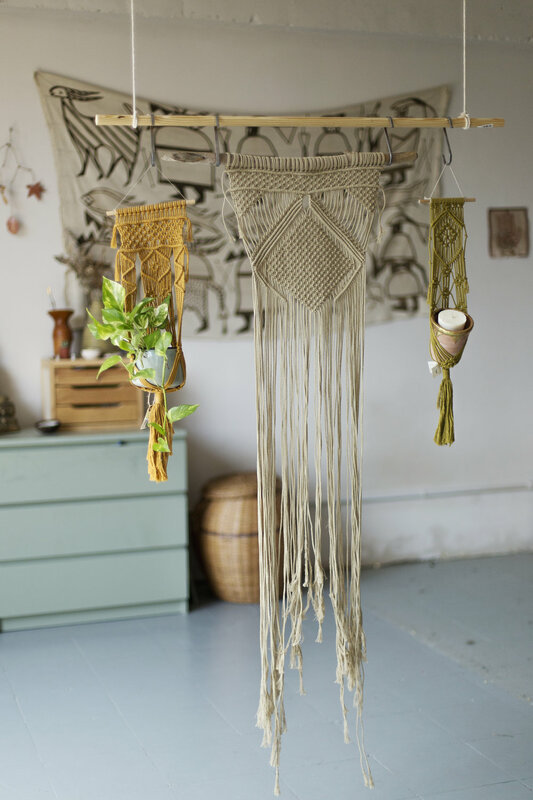 Learning those basic patterns gave way to explorations of the more complex art of macramé [en.“braided fringe”], which Ikram found stimulating as she set off on her motherhood journey. As if she rediscovered her old passion, at the same time as she rediscovered herself. The use of macramé was first recorded by Arabs, after that the technique spread to Southern Europe. Ikram entertains the idea that her grand grandmother might have done macramé as well. This would mean that as a teenager she somewhat subconsciously knotted herself into her ancestors’ culture. 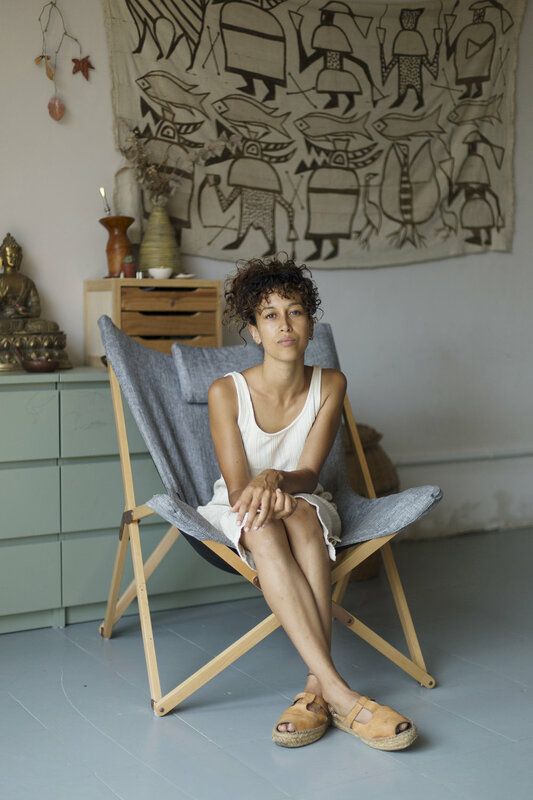 The strong passion for macramé was enough for Ikram to start her own business, Abha Macramé, where she both creates her own macramé pieces and teaches other people the craft of ornamental knotting. 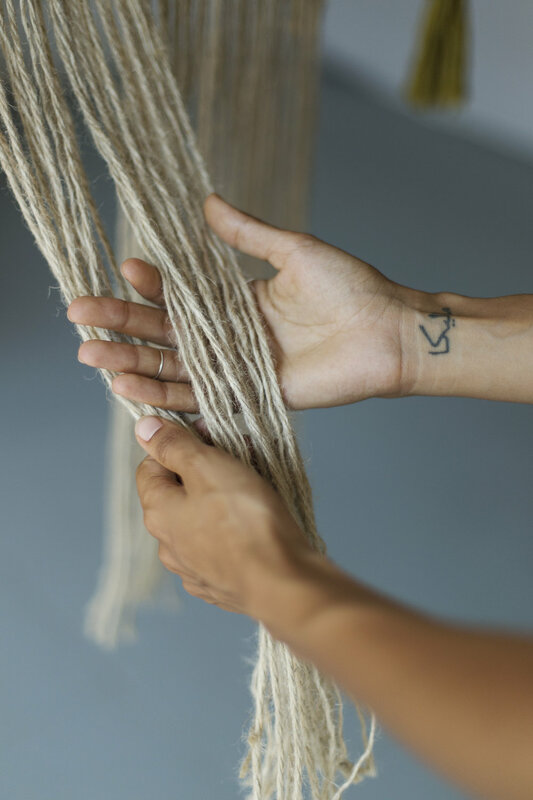 “Macramé is my meditation, I find it very soothing,” says Ikram. She explains that using natural fabrics like cotton, linen and jute, her bare hands as the only tool involved and at the same time being able to see the tangible results of her hands work makes her really happy. She wants to share this experience with others. Not many women admit how lonely they feel in their pregnancy. Four months before birth, Ikram and her partner moved to Bali, where their first met. Away from her family and friends, Ikram spend many hours on thinking about the relationship her and her mother have and how it has changed over time. She’d get up in the morning, go to the beach and wonder what kind of mother she would become. She was trying to decide what motherhood really meant to her. Those were long, deep and honest conversations she had with herself. Conversations that challenged her and her old opinions from before pregnancy. When I listened to Ikram’s story, I realised that I felt exactly the same way even though I didn’t move away from home during my pregnancy. Does this mean that the path of motherhood is a lonely journey? For it seems that taking up yet another identity - mother - is an enormous physical and mental transformation that you have to undergo on your own as nobody can do it for you. The lonely nine months on Bali were crucial to whom Ikram is today. She is both a mother and a woman who does what she loves. Just like in her macrame, she has used the raw materials of life experiences and woven them into her new stronger self.